When Trent Grimsey started to make his mark on the open water swimming, he was not known as a cold water specialist. But the Aussie distance specialist gradually became acclimatized to colder water temperatures and culminated his career by setting the most hallowed record in the sport: record holder of the English Channel in a blazing fast time of 6 hours 55 minutes. Upon retirement, Grimsey started coaching with his brother Codie at his Grimsey Adult SwimFit. 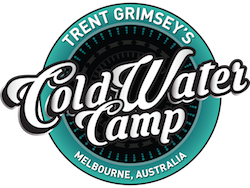 Being from Brisbane, it can be hard to find water cooler enough to prepare to take on the English Channel so I established the Melbourne Cold Water Camp at the Brighton Baths in Melbourne, Victoria on April 13th - 16th."